Hello again! It’s been just over two weeks since I summited Mt. Katahdin and finished my Appalachian Trail thru-hike. Now that I’ve taken some time to recuperate, I’m ready to start writing a bit more about my experience. 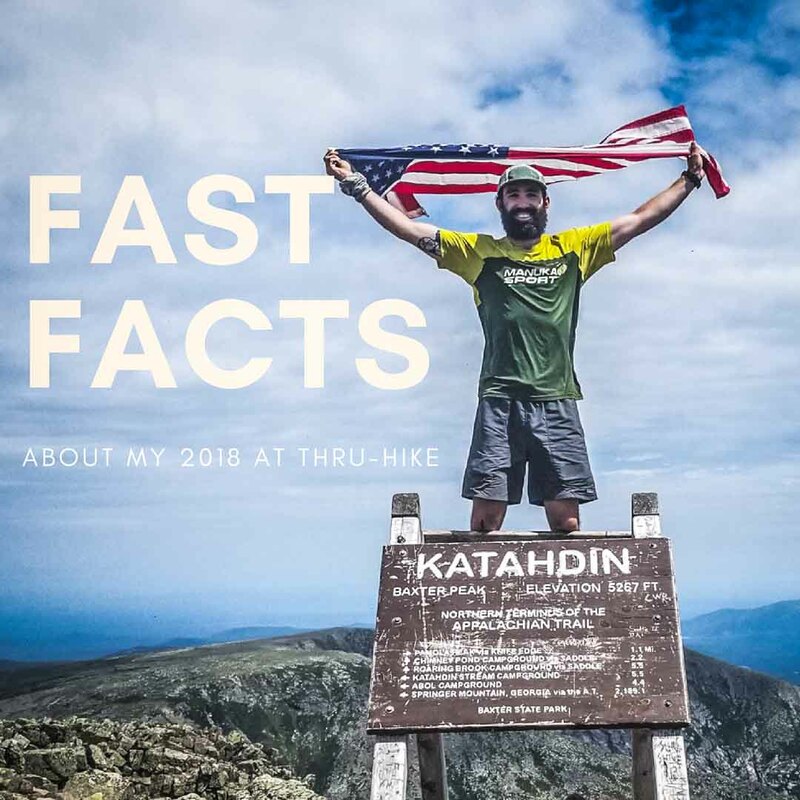 For my first post-AT article, I though that perhaps I’d indulge you readers on some fast facts about my hike including all the common questions I received before, during, and after my hike. I plan to expand on many of these topics in separate posts, but for now here are the details. Did you do the approach trail? Sort of – me and my driver got lost and I ended up starting near Nimblewill Gap, about the halfway point, so I did 4 miles of it. # of days on the trail: 97 (summited June 30). Average miles per day: 25-30. Highest mileage day: 32 miles. I wasn’t about the big mile days- I focused on consistency. Bodyweight lost: 26 lbs (187lbs to 161lbs). Lowest mileage day (other than a zero): 7 miles. Did you even have fun? : Absolutely! A lot of “Type II” fun, but overall it was a wonderful experience. Favorite moment on the trail: Corny, perhaps, but summitting Katahdin with my brother and childhood friend was the best. I had been looking forward to that moment for a very long time. # Pairs of shoes gone through: 5. They weren’t all trashed, but I had some feet issues that I tried to resolve with different footwear. $ Spent: $2,500 on trail plus ~$500 in food for resupply boxes. # of resupply boxes sent: 15. Was I sponsored? : Sort of. I’m an ambassador for two companies, ManukaSport and SnapNutrition, and they provided me with free product to use during my hike. Injuries sustained: ITBS for ~3 weeks and painful tailor’s bunions that lasted the whole hike. # of ibuprofen consumed: A lot – probably around 200 of the 200mg tablets. My bunions were murder. Favorite on-trail meal: Dinner at Woods Hole Hostel. Favorite hostel: Rattle River Lodge. Super clean, awesome crew, fabulous breakfast. Runner up: Boots Off Hostel or Shaw’s. Least favorite hostel: Laughing Heart or Uncle Johnny’s. They weren’t awful, but paled in comparison to places in the north. Favorite Trail Town: Waynesboro, VA.
# of Amazon orders: 5. Longest hiked with someone else: 15 days through New England with my buddy Logs, but he torched me in the Whites! Easiest section for me: New England up until the Whites. Hardest section for me: Southern Maine. Least favorite section: northern Pennsylvania into New Jersey. Not only because of the rocks, but also because it rained for about a week straight. Worst weather: 80mph winds on Mt. Washington. Going over those peaks were super sketchy and miserable. Favorite piece of gear: my pack – a Superior Wilderness Designs 40L long haul. Totally rocked. That’s it for now! Comment below if I missed anything or there’s something else you want to know. Previous Post:Weekly Trail Update #14: FINISH! You are such a rockstar!!! Enjoy DC!